Once the Lotus Cortina was homologated in September ’63, Lotus wanted to further promote the car, and announced the launch of 30 special build full works race cars for sale to private individuals. However, Lotus records confirm that ‘approx. 51’ such cars were manufactured over the life of the Mk 1. The cars developed 140bhp, and sold for £1725, more that half as much again the price of the standard car. Here is a description of the car in the announcement in Autocar in the November, as the first car is being delivered. Here is the specification of the car, taken from the document supplied by Lotus to the race car customer. ENGINE: TYPE: Cosworth Mark S-15. For most information on the engine see the separate notes supplied – READ THEM THOROUGHLY. 1. Oil level – the correct oil level for this engine is ¾ “ above the Ford Standard level – a new mark has- been made on the dipstick to this dimension. Oil consumption will be approx. 100 miles per pint. The oil level should not be allowed to fall by more than about 2 pints,or roughly back to the standard Ford mark. An extra oil pressure warning light is fitted to draw the driver’s attention to any failure of oil pressure. If this light comes on at any time the engine is running above idling speed, the cause must be most urgently looked into. 2. Rev. limit: the engine MUST NOT, ON ANY ACCOUNT, BE ALLOWED TO EXCEED 7000 R.P.M. 3. Cooling system: the fan and thermostat are omitted from this engine. Do not fit a thermostat – if over-cooling is experienced it may be cured by partially blanking the radiator. 4. This engine, for reasons of homoligation, is fitted with standard connecting rods. It is therefore ESSENTIAL that the rods are crack tested after every race: in any event, the engine should not, if at all possible, be allowed to cover more than 200 racing miles without this testing being carried out. If any rods are suspect, PROPERLY BALANCED replacements must be fitted – they can be obtained from Cosworth Engineering Ltd.
5. If it is ever necessary to replace the clutch pressure plate assembly, the new one must be balanced on the crankshaft/flywheel assembly and marked to ensure correct refitting thereafter. 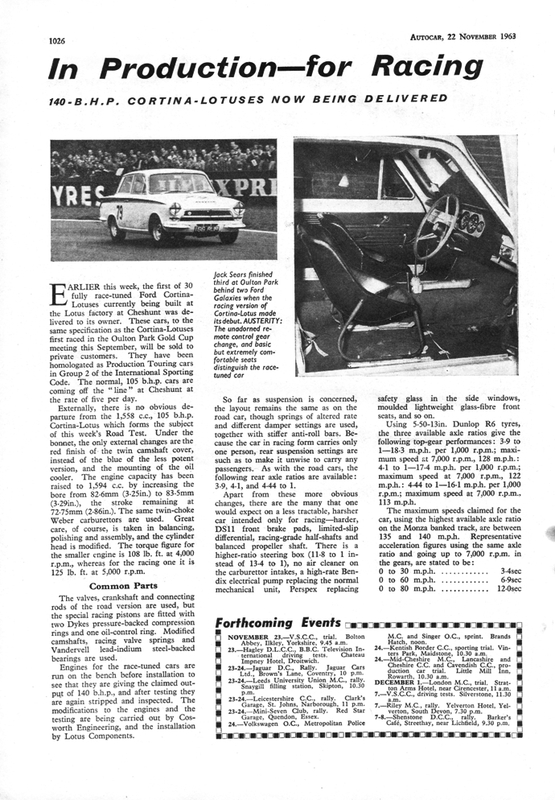 As far as assembly is concerned the car is the same as a standard Lotus Cortina and most information for the servicing can be obtained from the handbook supplied. Although normal running in is not necessary the car should be driven gently, initially, for as far as practical in order to run in the rear axle; if the axle is not run in it will rapidly become noisy and wear out prematurely. Check all suspension bolts front and rear after first run – particularly rear ‘A’ bracket bolts and diff. mounting nuts. The propshaft should be inspected after each race for any play in the universal joints – if the least amount of play is present the shaft must be renewed. Play in the joints will give rise to imbalance of the shaft. This is dangerous and must not be tolerated. The factory racing service dept. runs an exchange system for this item. (b.) Front brake pads are DS 11 material instead of DS5S. (c.) Front brake disc shrouds are omitted. N.B. The brake fluid will deteriorate with age, or if it is exposed to air. Care must therefore be taken that the cap is not left off any fluid container and that the fluid is completely changed at least once a season. The result of the deterioration is that the fluid will boil at a lower temperature than intended and this may give rise to boiling of the fluid under racing conditions and consequent loss of braking. Inspect all brake linings after every race – the front pads can be expected to last about 300-400 miles, the rear linings more, depending on the circuit. Front roll bar: this is very highly stressed and should be crack tested at least twice per racing season. Rear dampers – these are adjustable – turn the adjuster anti-clockwise to soften the ride. The recommended setting is about 18 clicks clockwise from the fully soft position. Crack test half shafts every 400 racing miles. When refitting bearings to shafts only use a new retaining ring of the correct type. N.B. The standard Ford Cortina ring will, if used, allow the bearing to pull off. Inspect the limited slip diff. regularly – by its very function it cannot be expected to last forever. Oil: Esso TSB 1434. No gasket, use Hylomar. A Bendix electric pump is fitted. The filter (at the bottom of the pump) should be cleaned regularly; no other maintenance of the pump is required. Windows, other than the windscreen, are made of Perspex, and it is recommended that they should be polished with a proprietary Perspex polish (anti-static). This car is a racing car; spare parts can only be obtained from LOTUS COMPONENTS Retail Stores – Racing Division. All enquiries should be addressed to these stores. (i) 18.3 m.p.h. per 1000 r.p.m. 3.9:1 ratio 5.50 x 13 R6 tyres giving 840 revs. per mile = max speed @ 7000 r.p.m.128.1 m.p.h. (ii) 17.4m.p.h. per 1000 r.p.m. 4.1:1 ratio 5.50 x 13 R6 tyres giving 840 revs per mile = max speed @ 7000 r.p.m.121.8 m.p.h. (iii) 16.1 m.p.h. per 1000 r.p.m. 4.44:1 ratio 5.50 x 13 R6 tyres giving 840 revs per mile = max speed @ 7000 r.p.m. 112.7 m.p.h. On the following page you will find the Racing Spec. which gives a parts/number breakdown on the Racing Conversion Lotus Cortina. a)Springs; Part No. 28 C 010A – 140 Ib/in. Rate. Loaded Height 5.17″ @ 508/5421b. N.B. Droop Stop is lengthened by ¾” as compare with standard. a) Springs: Part No. A28 D 006A 80 lb per inch rate. b) Dampers: Part No. At.9A/2765 (adjustable). As standard but fitted with special front bushes – Metalastik No. 13/1519 in 1MN70 Rubber. a) Standard discs and callipers. c) N.B. Disc shrouds should be omitted. a) Master Cylinder .75″ bore Part No. 64067947.
b) Fluid Girling Extra Heavy Duty. Fitted limited slip diff. Hewland Part No. HG. 400. 7. Transmission: Racing grade drive shaft. High Ratio box fitted (11.8.1) Part No. 28 H:710A. Standard Wheel with Dunlop Racing 550 x 13 R6 tyres. ” ” 28 B 349 Rear Screen. b) Glass Fibre bucket seat. Part No. 28.B.739A (LH) 28.B.740 (RH). c) Seat Belt (Full Harness) Irvin CH 5.
d) The following items are removed: Heater, Parcel shelf. Floor mat, Underfelt, Transmission console. Front and Rear bumper and brackets, Aircleaner. a) Lotus modified twin cam engine, bored out from 1558 c.c. to 1598 c.c. b) Oil cooler take off casting. c) Mechanical fuel pump removed and blanking plate fitted. d) Camshaft cover painted red. Similar to Special Equipment car but having a bore of 2″. Part No. 28 S 707B. Air cleaner omitted – bracket fitted to support front of flexible hose – Part No. 28 S 036.
a) Electric Fuel Pump Part No. 28 M 063.
b) Large bore fuel line (tank to pump – 28 L 006). c) ” ” ” ” (pump to carb – 28 L 010A).